How Will Sunday's Rocket Explosion Affect SpaceX? SpaceX's Falcon 9 rocket explodes less than 3 minutes after launching the company's Dragon capsule on a robotic cargo run to the International Space Station on June 28, 2015. Sunday's explosion of the commercial SpaceX Falcon 9 rocket has put a dent in the booster's impressive track record. SpaceX must fix whatever caused the problem and return to flight in order to fulfill billions of dollars of launch orders. The company's Falcon 9 rocket disintegrated 139 seconds after liftoff Sunday (June 28), ending the seventh operational flight under SpaceX's Commercial Resupply Services contract with NASA. While NASA has stated it will rebound from the loss of ISS cargo, space analysts contacted by Space.com have flagged a number of wait-and-see ripple effects stemming from the accident. "SpaceX's response to the failure will be more important than the actual failure, in terms of future business impact," said Carissa Bryce Christensen, a founder and managing partner of The Tauri Group in Alexandria, Virginia, a company that provides strategic planning and technology assessments for civil and government clients. "NASA, the Air Force and commercial customers will all be watching SpaceX's engineering and management processes at work, looking for SpaceX to demonstrate its solidity and maturity as a launch provider," she added. Also watching the upshot of the booster misfortune is Rand Simberg, author of the book "Safe Is Not an Option" (Interglobal Media LLC, 2013). He is an admitted "recovering aerospace engineer" with more than 30 years of experience in the space industry. Simberg said it's a little concerning that SpaceX has not already identified the cause of the launch failure. "They are usually pretty fast at that," Simberg said. "If the telemetry doesn't tell the tale … and they have to hope they'll find enough debris to figure it out, that's bad news." The SpaceX booster mishap also throws uncertainty into the schedule for the inaugural flight of the company's Falcon Heavy booster that was on tap to fly later this year, "unless they fly it with an inert upper stage," Simberg said. The good news, Simberg said, is that any crew onboard a human-rated Dragon capsule probably would have survived, as long as the craft's launch escape system was used. "The other good news is that the first stage still seems to be rock solid in its performance," he said. "I find it ironic that this happened just a month after SpaceX got Air Force certification. It makes one question the utility of that lengthy and costly process," Simberg concluded. Other space analysts were more forgiving about the incident. "I kind of take it in stride, because this is not a brand-new vehicle. It has had a fair amount of success," said Marco A. Cáceres, a senior space analyst at Fairfax, Virginia-based Teal Group, a team of researchers who keep an eye on the aerospace and defense industry. "It's not like there's a fundamental design flaw to the vehicle," Cáceres said. He believes that SpaceX probably will be flying again in the next two to three months. Getting back in the air as quickly as possible "would get the public and the government to forget about the failure," Cáceres said, adding, "I think I would reserve judgment until I see their next try." 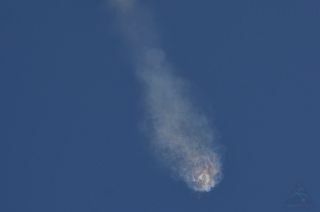 SpaceX President Gwynne Shotwell said in a post-accident news conference that the company does not think the accident was caused by a problem with the first stage. "We saw some pressurization indications in the second stage, which we will be investigating," she said. Similarly, SpaceX founder and CEO Elon Musk tweeted shortly after the failure, "Falcon 9 experienced a problem shortly before the first-stage shutdown. There was an overpressure event in the upper stage liquid oxygen tank." One payload that's slated for SpaceX booster delivery to the ISS this year is the Bigelow Expandable Activity Module (BEAM), which has been developed by Bigelow Aerospace under a contract with NASA. "BEAM will be ready when they [SpaceX] are," said Mike Gold, director of Washington, D.C., operations and business growth for Bigelow Aerospace LLC. "If I know SpaceX, it's going to be sooner rather than later." BEAM is now ready for shipment from the firm's plant in North Las Vegas, Nevada, to NASA's Kennedy Space Center in Florida, Gold said. Regarding the Falcon 9 problem, Gold said, "The story here to me is not that they had a failure. A failure should have been anticipated. They've had 18 consecutive successful launches. It's that track record that they enjoyed prior to this time. That should give the industry great faith in the system." Gold also serves as chairman of the Federal Aviation Administration's Commercial Space Transportation Advisory Committee, or COMSTAC for short. COMSTAC was established in 1984 to provide information, advice and recommendations to the FAA administrator on critical matters concerning the U.S. commercial space transportation industry. "The Achilles' heel of the commercial space industry remains the paucity of funding for the FAA's Office of Commercial Space Transportation," Gold said. "This accident will only further aggravate what was already a critical situation for that FAA office relative to lack of funding and lack of personnel." Gold said he is hopeful that Congress will see its way to fund that FAA office at a required level to ensure stable commercial space growth. In taking a long look at commercial space operations, Cáceres remains bullish. "I don't think there's a turning back here … going back to the way it was in the past 50 years, where NASA was by far the dominant player," Cáceres said. "It's going to go more the way other major industries have gone, like the way [the] railroad, automobile and aircraft industries developed very early on in their histories." Cáceres said that, for some reason, space became different: It was looked upon as more complicated and much more dangerous, so the government played the leading role. "We've moved into this new era, this new paradigm, and we're still at the very, very early stages," Cáceres said. "For those that say we should turn back, I don't see that happening." Leonard David has been reporting on the space industry for more than five decades. He is former director of research for the National Commission on Space and is co-author of Buzz Aldrin's 2013 book "Mission to Mars – My Vision for Space Exploration," published by National Geographic with a new updated paperback version released in May. Follow us @Spacedotcom, Facebook or Google+. Originally published on Space.com.